This pepper and ginger based blend gives a very special twist to the taste of tea. The ginger and pepper elements in the blend adds an extra warmth that can take the chill out on wintry days. Usage Usage Used most commonly to add a spicy-warm flavour to tea and milk. It is also used to make 'Ukala'*, a drink popular in Western India. *'Ukala' is a hot brew of milk, water, sugar and a pinch of Everest Tea Masala. Ukala is ideal for those who need to take milk but do not like it plain. 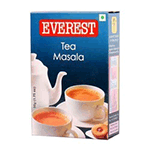 Masala Tea To get the best flavour add Everest Tea Masala while you boil water to make tea. For 2 cups of tea ¼ tsp of Everest Tea Masala will suffice. It not only adds a special flavour to your tea but also make you come alive with freshness.